In the graph above, the blue line is the VIX, the implied volatility of the S&P 500 as read off the options market. It is a good measure of US and global economic uncertainty. 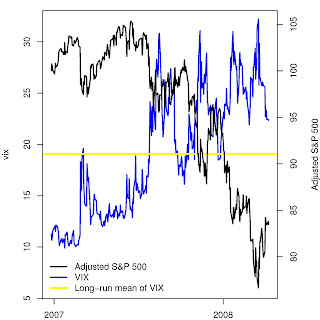 The horizonal yellow line is the long-run average value of VIX. It helps us place recent values of VIX in perspective. The black line is the S&P 500. However, instead of the conventional index levels, I use the US Major Currencies Index (produced by the US Federal Reserve) to adjust for the decline of the US dollar. The black line can thus be seen as a measure of the S&P 500 as seen by someone who keeps score in a floating currency. The VIX shows four peaks in the last one year, with the fourth peak being particularly high - this is the day Bear Stearns died. The black line shows a sharp drop across these events -- a 19% fall in all -- reflecting a combination of a poor showing by the S&P 500 and by the US dollar. Ever since the financial disturbances of last year began, there has been fresh interest in understanding how they came about and perhaps in then figuring out ways in which such disturbances can be avoided. Here's my attempt at organising the thinking which has been taking place on both diagnoses and remedies, which is also a linkfest so you get all the underlying materials. Why was there such a surge in demand for a yield pickup? This leads to explanations emphasising monetary policy and the impact of interest rates on risk taking. Why did dodgy practices with home loans and their securitisation process flourish? This leads to explanations emphasising the difficulties in regulation. The brunt of this story seems to be in the US, since the bulk of sub-prime loans happened there. As an example, there isn't much sub-prime housing debt in the UK. When difficulties arose, why did liquidity collapse in key markets? Why did we get a run on Northern Rock - despite its excellent portfolio? Why did we get a run on non-bank players like Northern Rock and Bear Stearns? How can the role of monetary policy be changed so that key markets stay resolutely liquid in the future? There are a few other questions out there which, in my mind, are better understood. Why did a modest rate of default in a relatively small part of finance lead to such a crisis? (My answer: There was a lot of leverage out there). Did the Fed do right in rescuing Bear Stearns? (In my opinion, Yes). Why has the impact on the real economy of these events been relatively modest? (My answer: There is little leverage amongst the firms, and firm profitability has been pretty good, so there hasn't yet been a wave of layoffs). I feel these things are relatively better understood. So I will focus on the big three questions that are the puzzle. One element of the story is the USD pegs run by many countries. This led to a massive scale of purchase of US government bonds by foreign governments, thus depressing yields of US government bonds. On one hand, this led to a lack of market discipline from the bond market upon the expenditure patterns of US government and households. On the other hand, it gave many institutional investors acutely low interest rates on their traditional fixed income portfolios, and led to a quest for non-traditional products that would achieve a yield pickup. John Taylor points out that Greenspan diverged substantially from a reasonable notion of what the Taylor rule should do, in keeping interest rates too low, too long. How might government-induced interest rate distortions lead to trouble in Finance? Raghuram Rajan had a great speech from June 2006 sketching channels of influence from low interest rates to risk taking. Q2: Why did dodgy practices on home loan origination and securitisation flourish? Raghuram Rajan wrote an article in FT emphasising the mismatch in time horizons between compensation and portfolio performance that afflicts senior employees of banks. This falls in the larger context of the deeper difficulties of banking as a business from the viewpoint of public policy. However, as the story of Bear Stearns shows, employees do have a lot to lose if the firm goes wrong. It isn't asif they walk away scot free. With hedge funds, there is absolutely no difficulty of this nature. (Gary Becker is not convinced that compensation policies are flawed; he points out that many hedge funds and PE funds - where compensation practices are perfect in terms of aligning the interests of staff - also suffered large losses). The reforms proposal from the US treasury is focused on problems of US financial regulation, on why a byzantine system of regulation failed to see difficulties and resolve them [backdrop]. See the press release, fact sheet, full report, main web page. Here's an analysis of the Paulson proposal by Howard Davies. Sebastian Mallaby reviews the experience of hedge funds in these months. Jayanth Varma thinks this is the end of the beginning of housing finance, that when we pick up the pieces and do it again, we could do it right. In all these difficulties, it is fair to point out that Basle-II (with a fresh think on some issues such as the role for credit rating agencies) would help. Q3: Why did liquidity collapse in key markets thus doing damage to Finance? Act 1: Northern Rock. A few months ago, I think a fair consensus built up around the ideas that the ECB's more relaxed rules of collateral have worked better, and that the UK's effort at having less deposit insurance didn't work. Jayanth Varma is not happy about the FSA review of the supervision of Northern Rock. Also see his review of evidence and diagnoses of the Northern Rock espiode. Act 2: Bear Stearns. The hearings of US Senate Committee on Banking are a great resource on the story of Bear Stearns. In particular, see Ben Bernanke Christopher Cox Robert Steel Timothy Geithner Jamie Dimon Alan Schwartz. Why bank risk models failed by Avinash Persaud reminds us of an argument that he made a few years ago, about too many Ph.D.s armed with the same mental infrastructure, analysing the same data, come up with correlated trading strategies. We have not adequately taken into account the implications for asset pricing and liquidity at large, of a large number of traders behaving in optimising fashion in the small when armed with correlated micro models. Persaud suggests that this world suffers from a heightened risk of `liquidity black holes' when too much money wants to buy or sell en masse and the counterparties aren't to be found. Of course, some of these Ph.D.s will see this reversion in the data and become contrarian. Persaud's argument, is that we're at the first flush of the quantification of trading and money management and we're still learning how the game shapes up. 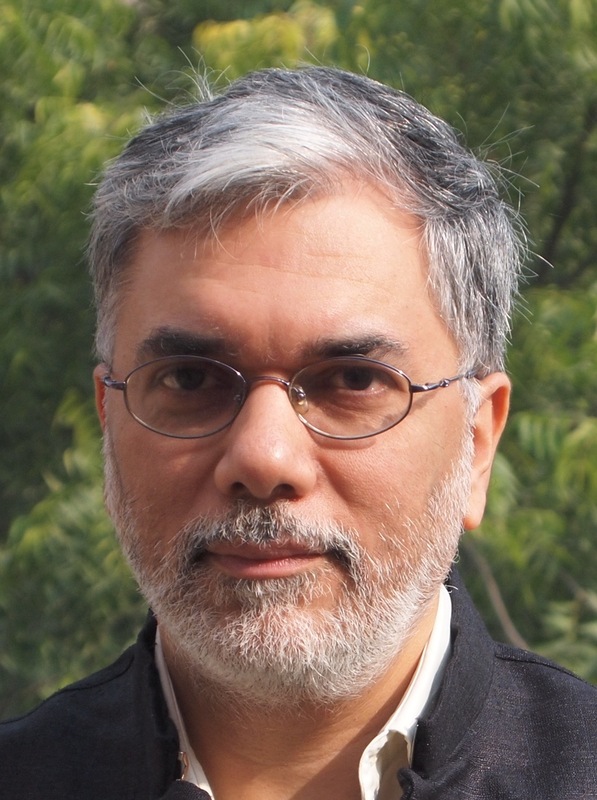 Jayanth Varma points to the great work that the researchers are rapidly coming out with in this field. On 12th December, the US Fed announced the Term Auction Facility (TAF). Stephen Cecchetti summarises the new efforts of the US Fed in overcoming the difficulties of traditional methods for implementing monetary policy. In April 2008, John Taylor and John Williams had a paper out titled A black swan in the money market modelling the collapse in liquidity and measuring the impact of the TAF (they say there isn't much of an impact). In my mind, recent events emphasise the benefits of both exchange-traded derivatives and the clearing corporation [link]. A lot more can be done using exchange-traded products than is presently the case, but some regulators have an inexplicable bias against exchange traded. See this article in The Economist on this issue also. Alan Greenspan has an interesting response to these diagnoses. His pithy ending: We have tried regulation ranging from heavy to central planning. None meaningfully worked. Do we wish to retest the evidence? In his article Percy Mistry interprets the sources of difficulty. Richard Katz compares the US today against Japan in its difficult years. Howard Davies did a great speech on 15 January titled The future of financial regulation. Also see Options paper from Financial Safety Forum. It would be convenient to blame the regulators for all that, but the system is stacked against them. They are paid less than those they oversee. They know less, they may be less able, they think like the financial herd, and they are shackled by politics. In an open economy, business can escape a regulatory squeeze in one country by skipping offshore. The notion that the world can just regulate its way out of crises is thus an illusion. Rather, crisis is the price of innovation, so governments face a choice. They can embrace new financial ideas by keeping markets open. Regulation will be light, but there will be busts. The state will sometimes have to clear up and regulation must be about cure as well as prevention. Or governments can aim for safety and opt for dumbed-down financial systems that hobble their economies and deprive their people of the benefits of faster growth. And even then a crisis may strike. And, see Robert Shiller on innovation. 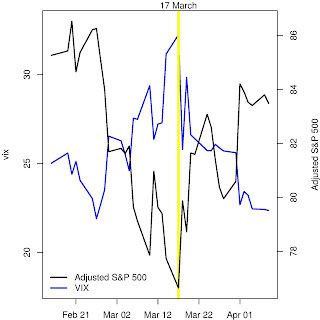 The figure shows the movement of VIX and the S&P 500 (once again, adjusted for fluctuations of the USD) in the most-recent episode. The vertical yellow line is 17th of March. We see a sharp outburst of fear and then it subsided. See an article that I wrote on 18th afternoon in Indian time (i.e. early morning of 18th in the US). Also see the associated blog entry. 1). Under Q2, second para: link to "main web page". 2).third last line of the article: link to "an article that I wrote on 18th afternoon". Thanks, Ravi, Fixed these. :) Given enough eyeballs, all bugs are shallow. Q1: Why was there a surge in demand for a yield pickup? You are absolutely right in saying that monetary policy was loose, but then the question is why did it feed into asset prices rather than goods prices. It is the answer to this question that takes us to finance as opposed to economics. I often say that we must approach the study of finance with Ito's Lemma in one hand and a copy of Kindleberger's Manias, Panics and Crashes: A History of Financial Crises in the other. This is question 1 in a different form: greater tolerance for operational risk instead of market risk. I would argue that liquidity collapses when prices are not allowed to fall. Why are the ABX contracts liquid? Because they have been allowed to undershoot. The ultimate providers of liquidity in any market are the value investors and they do not enter until prices have undershot. Why did a modest rate of default in a relatively small part of finance lead to such a crisis? My answer: The real problem is not sub prime (which is only the canary in the mine), but falling real estate prices. Real estate is a huge part of finance. Did the Fed do right in rescuing Bear Stearns? First, as Kindleberger used to say, "A lender of last resort should exist, but his presence should be doubted." Even after LTCM, there could be doubts. After Bear Stearns, there can be none. This is a great tragedy. Second, I can understand LOLR, I can even understand outright nationalization (Northern Rock). I cannot understand buying a second loss credit linked note on $30 billion of hard to value securities. Why has the impact on the real economy of these events been relatively modest? My answer: Canary in the mine again. I believe that this crisis has shown the power and utility of financial markets. Policy makers have had at least a year of lead time to deal with the problems in the real economy. Without mark to market and without liquid ABX markets, the crisis would have become evident only when mortgages actually defaulted. By then it would have been too late to act. It is difficult to persuade people about this in today's context, but even today it is true that with all their imperfections and tendency to malfunction during crises, financial markets are the closest thing that we have to the crystal ball that reveals the future. Everything else is backward looking. What is the undistorted rupee-dollar rate? Has inflation targeting stood the test of time?